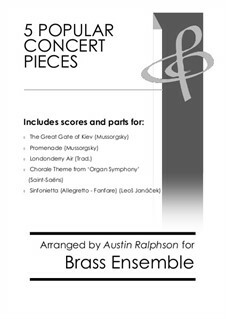 This bundle of brass ensemble music represents a huge saving on the prices of the individual arrangements, and comprises 5 popular pieces which are ideal for concert purposes. From the quiet, emotional 'Londonderry Air', which has been arranged as per the version featured in the 'Brassed Off' film, to the huge 'Sinfonietta' by Janáček, there is a whole range of music here. Much of it is aimed at advanced players as the level of challenge is high, but they all work incredibly well once rehearsed properly. Three of the arrangements also have parts for percussion included with them as well.